I hope you enjoyed yesterday’s swaps I shared with you. I have some more today. 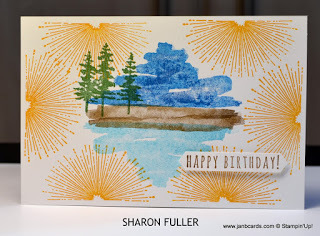 Sharon Fuller – used the Waterfront Stamp Set and the Sale-a-bration (SAB) stamp set called Amazing You. 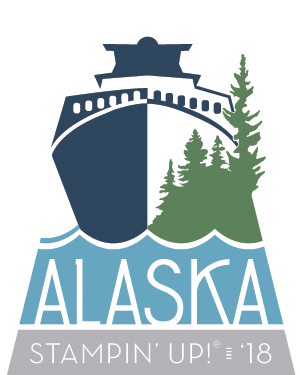 I haven’t played with the Waterfront Stamp Set yet and have seen some really beautiful projects made with it. 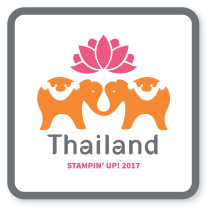 The stamps are very much water coloured images, which really play together exceptionally well. The sun image Sharon has used to create a background is from Amazing You, and not a connection I would have made but it’s an excellent choice – in fact, it’s an excellent card! 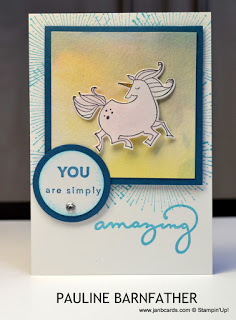 Karen Franks – made the first of two unicorn cards I received which uses the stamp set called Magical Day, which is available as the Magical Day Bundle. Yet another set I have but haven’t played with yet! 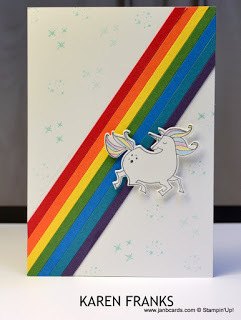 The rainbow stripe has been made with stripes of cardstock. I think the unicorn’s mane has been coloured with watercolour pencils. Pauline Barnfather – has also used the Magical Day Stamp Set as well as the SAB Amazing You Stamp Set for the sun stamp for the background, as well as the sentiments. To colour the unicorn and the layer the unicorn has been attached to, Pauline has used the Brusho Watercolour Crystals. Pauline has also painted over the unicorn with her Clear Wink of Stella Glitter Pen. The unicorn is layered onto a piece of Island Indigo Cardstock, (CS) and the stamping has been done using Bermuda Bay Ink. 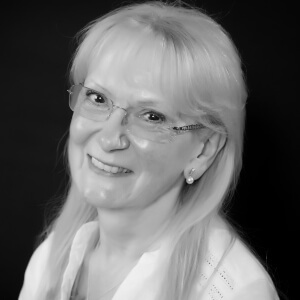 Susanna Tolkien – has used another SAB stamp set which is called Party Pandas. 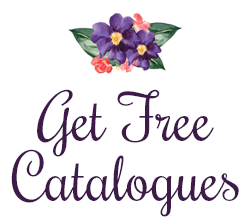 I have to say the selection of stamp sets available as free gifts in the Sale-a-bration catalogue this year is absolutely brilliant! 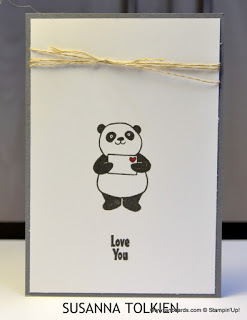 I love cards that are plain and simple, and pandas help with this as they are black and white! I’m not sure which black ink Susanna has used. It depends on what she’s painted the red heart with – Marker Pen = Basic Black Archival Ink; Stampin Blends = Tuxedo Black Memento Ink. I would assume it’s Basic Black Archival Ink and Real Red Marker Pen, because I think it’d be easier to colour such a small area like the heart with a Marker Pen, rather than a Stampin’ Blend. The top of the panda layer has been wrapped round with Linen Thread and then mounted onto alayer of Basic Grey CS. 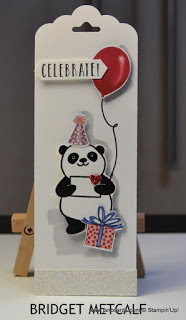 Bridget Metcalf – also used the Party Pandas for her swap but make a bookmark instead of a card front. Bridget heat embossed the panda using black embossing powder and then fussy cut him. The black embossing really has made the panda stand out brilliantly! She punched a heart, using Red Glimmer Paper, instead of colouring it, although I’m not sure which punch – or possibly a die – the heart is from. The balloon, party hat and gift have all been fussy cut from the Birthday Memories Designer Series Paper (DSP). This is a charming bookmark and I’m really pleased that Bridget had the patience to fussy cut 84 pieces to make twenty-one swaps!! Bridget has also done a brilliant job on shadows behind the panda. As well as grounding him, she has also added a shadow all down the right-hand side of his body and behind the balloon. Superb attention to detail! 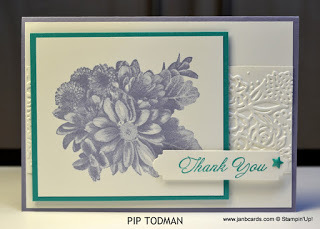 Pip Todman – has been extremely generous, and made a complete card, rather than just a card front. She has used another SAB stamp set called Heartfelt Blooms. 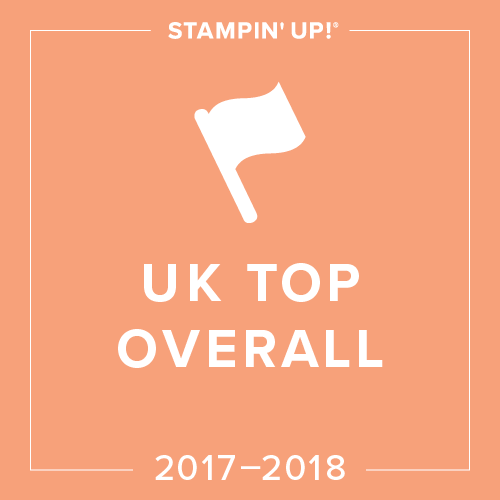 This stamp set is extra-special because it’s a first! 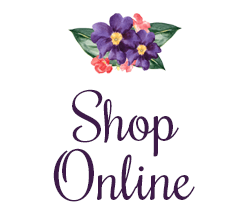 It has been produced by a new digital method which I understand is being patented by Stampin’ Up! Pip has used Wisteria Wonder for the image and the card base, then added Bermuda Bay for the layer behind the image, the sentiment and the little accent. On the first layer of Whisper White CS, Pip has adhered a strip of Whisper White CS that has been dry embossed using the flowery embossing folder in the Petal Pair Embossing Folders. I hope you’ve enjoyed sharing my swaps as much as I have enjoyed sharing them with you. 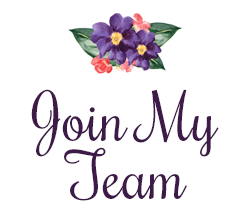 Don’t forget, if you’d like to be part of the team to join in with events like this, I would love you to join my team. 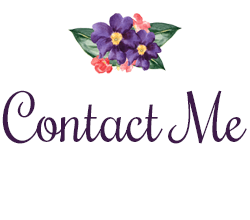 Email me at janb@janbcards.com if you’d like more details.